Halloween is meant to be a scary and FUN event but for some kids it’s only scary. For others, especially those who are anxious, sensitive or have a history of trauma or other special needs, Halloween can be down right terrifying. When Halloween frights trigger fight or flight it’s no longer fun. I’ve spoken before about how Preston has Developmental Trauma Disorder. His history of trauma gave him an intense fight or flight reaction when scared. And Halloween is full of triggers. I totally understand this is intentional, and the whole idea of Halloween for some people is the scare factor, but for some children, especially those that are anxious or sensitive, it’s simply too much, but I think there is still an opportunity for them to have fun and enjoy the holiday as well. Jackson has always loved Halloween. Transforming himself into something else for a night, the candy, the scares, he loves it all. But he is a kid who loves over the top drama and excitement. Trying to balance our two kids very different needs has been a challenge over the years. When Preston was about 4 years old we tried to take the boys trick or treating. We chose a neighbourhood he knew well (his grandparents), where the houses were nice and close but there were not too many trick or treaters. He was really excited. He could see this was something his brother really loved. But those pumpkins terrified him. Of all the things that could have triggered him, it was the carved pumpkins. Preston also has extensive speech delays. So he couldn’t say Trick or Treat. Instead he stood in the middle of the street in front of every house that had a pumpkin on the porch and screamed what sounded like STINKY FEET while his brother went up to the door and politely trick or treated. Thankfully the neighbour’s were understanding, but it was embarrassing, stressful and extremely funny. Seriously, I was the mom standing beside my kid who was four, looked about seven (Preston is huge, he will be about 6’5” when grown) and was yelling stinky feet over and over again. It was a gong show! But here’s the thing, even though he was being triggered he wasn’t going into fight or flight. He was riding it out and finding ways to cope. This was HUGE! In previous years Halloween had always been a blend of panic attacks, fighting and running away. Definitely not fun. But this was a big improvement and with each year he has become a little braver and able to do more. Last year he actually went up to a few houses and when we said it was time to go home, he begged for more! We are still very cautious and approach every Halloween with a plan, but with each year he is getting bolder and it makes my trauma mama heart so happy to see him growing and healing. 1) Visit places the child knows well from before Halloween and do your best so show them it is the same place with just a little “make-up”. We visited a local greenhouse that has a Halloween event each year. I made sure to bring the boys to the greenhouse in the weeks leading up to Halloween so the place was familiar. We also Trick or Treat in neighbourhoods familiar to my boys. 2) Keep it short. If things are going well, don’t push it. Your child is probably working really hard to hold it together and if at all possible you want to end with success. 3) Be creative with Halloween costumes. 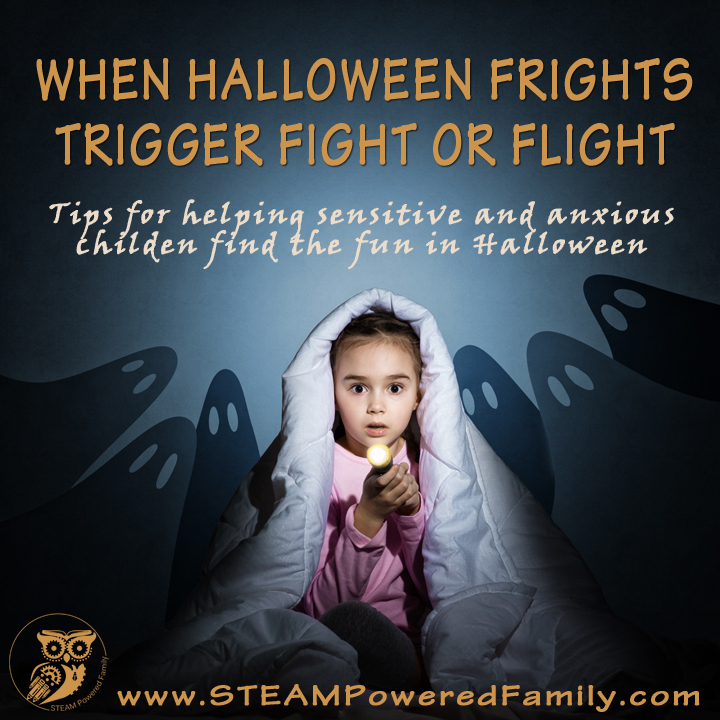 Make sure there is nothing about the costume that will trigger any sensory issues or cause issues if the child panics and you need to catch them or carry them. You also need to make sure they can move freely so if they do run they don’t trip or get hurt. 4) As much as possible be on guard around other kids and even other adults and step in quickly to protect your child. Other people may think it is funny to scare others and some kids really get off on causing a reaction in other children and will keep pushing trying to get bigger and bigger reactions. This isn’t OK and needs to be stopped immediately. You need to be your child’s protector. 5) If your child is older find out what is happening at the school and talk to the school if needed to ensure your child will not be triggered at school. 6) It’s OK to say no. There are lots of events we haven’t done simply because I knew the environment was going to be too chaotic, too focused on the scare and not appropriate. As much as I know it’s meant in fun, I need to protect my son first, and if he is triggered it can take days to get him regulated again and it will damage any healing he has done. It’s hard saying no, but I need to do what is best for son. I hope you all are able to find a way to have a fun, safe and trigger free Halloween. Previous Post: « Circuit Bugs – The original creator of Circuit Bugs!